My grandmother had a pan called a waterless cooker. It was a heavy cast aluminum, with a tight fitting lid, that held heat beautifully. The concept was that you could use it to cook food with very little energy (gas was expensive, when she started housekeeping!) and without boiling the food and then draining away the flavor and nutrition. In fact, she had a set of three. They were heart shaped,and nested together on one burner, so you could, in theory, cook an entire meal over one burner. She gave one each to my aunts, and the one she kept eventually came down to my Mom after her death, and it is now mine. But I’d lived with her a while, as an adult, and learned to cook in it… and learned to cook the same way without it. 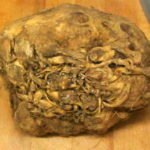 It is wonderful for root vegetables. 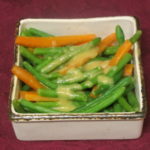 One reason many people dislike cooked carrots and other root vegetables is that they have to be cooked long enough to soften them – by which time, with many methods, you’ve boiled all the flavor away. With this method, though, you cook with just enough water to give a bit of steam, over very low heat, and the roots are tender and tasty. Grandma cooked whole new potatoes that melted in your mouth… and wonderful thin shredded carrots. Now, I’m using a small enameled cast iron saucepan. This isn’t ideal – it has a spout, so some steam escapes, but most really is held in. 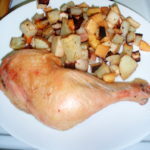 If you don’t have that, I’ve also done this in the small slow cooker, and the basic concept would work in a tightly covered dish in the oven, but the technique for that is a little different. The crucial part for the pot on the stove is that it is heavy enough to really hold heat well, and evenly, so the bottom won’t burn when it is not covered with water, and the food won’t stick. I put the empty pot over a medium low heat on the stove, to let it heat up gently, while I cut the first carrot. 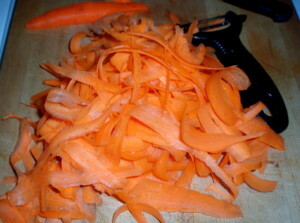 (I cooked two large carrots, for the two of us.) Then I put a very thin slice of butter in the bottom – half a teaspoon at most – and put in the carrot shreds, which pretty much filled the pot. I sprinkled a little water in with my hand, put the lid on, and lowered the heat as far as it would go, while I shredded the second carrot. By the time it was ready, when I opened the pot, the first carrot had softened enough that I could put the rest in, pushing it down a bit. I now added a slightly thicker slice of butter – still less than a whole teaspoon – and just a little more water. (I hope you can see it in the spoon – again, not much more than a teaspoon.) I would actually use less water in the original pan – there is some steam escaping from this one. Then I covered the pot, made sure the heat was as low as it would go, and cooked it about 7-8 minutes. The exact timing of this may vary, depending on exactly how low your heat will go – check it after 5 minutes… The very bottom of mine had just started to caramelize, which is delicious and sweet – but you don’t want it to progress to burning. After that, I turned the heat off, but left the lid on, so the carrots would continue to cook in the steam and the residual heat of the pan. It was fully cooked after about another 5 minutes off the fire. I’ve used my little slow cooker for this. It heats quickly, so I just drop in the carrot right away, a touch of butter, and, again, less than a teaspoon of water. Then I cover it and cook for about 2 hours. Most larger slow cookers I’ve had take nearly an hour just to heat up, and I haven’t used one of them. This does reheat well, though, and I could see using a food processor to slice a whole bag of carrots, putting them in a cold slow cooker on low for about 4 hours, then freezing them in single portions (muffin pans are good for that) to carry in lunches that will be heated. I have not done that myself, though. In an oven – again, a cool pan with a close fitting lid but a preheated oven. 350º for half an hour will do it. You could skip the butter, but Grandma always used it, so I do, too. Dill is a lovely addition – sprinkle it in on top of the carrots at the beginning. 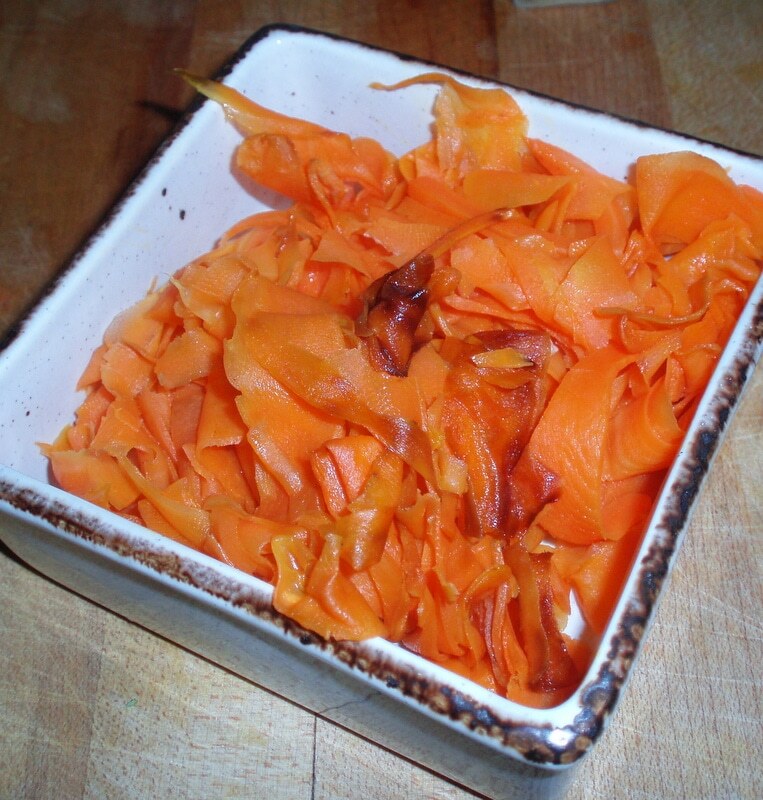 This tastes nothing like the average boiled carrot – discover a new vegetable! 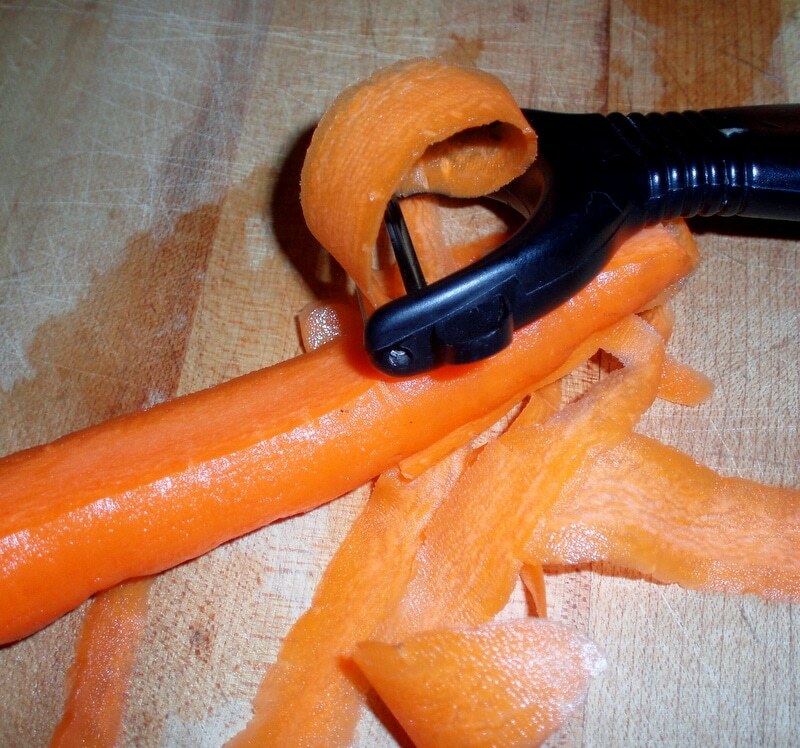 Use a mandoline or a swivel bladed vegetable peeler to slice carrots into very fine slices. Heat a heavy pot over low heat. drop in half the butter, swirl it around the bottom of the pan. Drop in the carrots, the rest of the butter, and the water. Cover the pot, lower the heat as far as it will go. Check after five minutes to see if carrots are softening, and stir them around slightly, to bring up the layer on the bottom. Cover again. 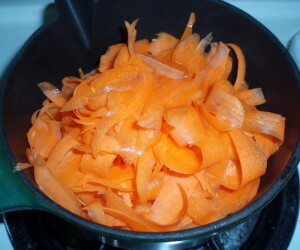 After another 2-5 minutes, turn off the heat, and let the carrots finish cooking in the residual heat of the pot. Thank you! 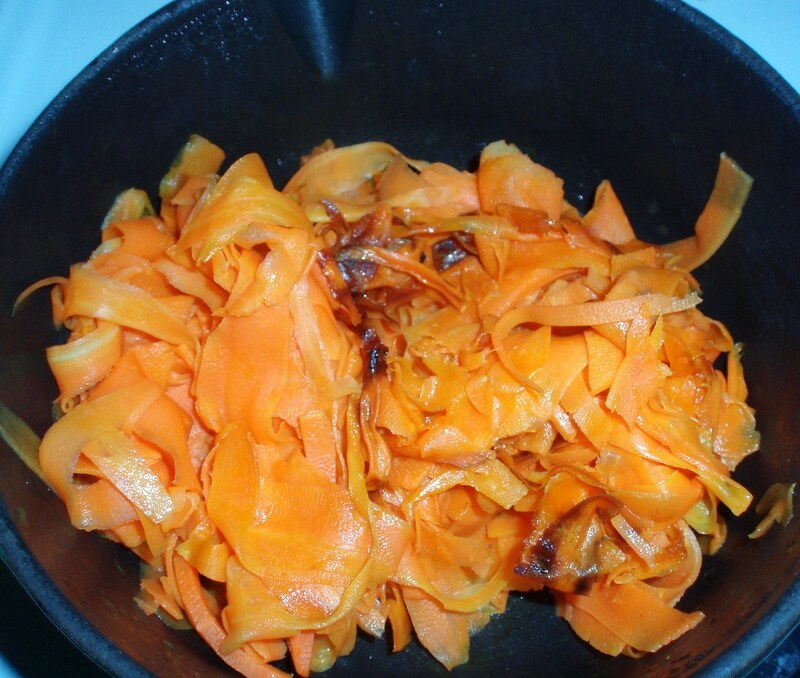 I like being able to make such an ordinary thing as a carrot taste so much better than boiled. I hope the children like them! Hehe, you're welcome. It's a really great recipe we'll be using on the big day :) Thanks for linking up to #recipeoftheweek. Have Pinned and tweeted this post too.